The school zone has been defined clearly with road humps and pedestrian crossing follows by the entire strips of road covers with interlocking red tiles instead of normal tarred road on either side of the road. 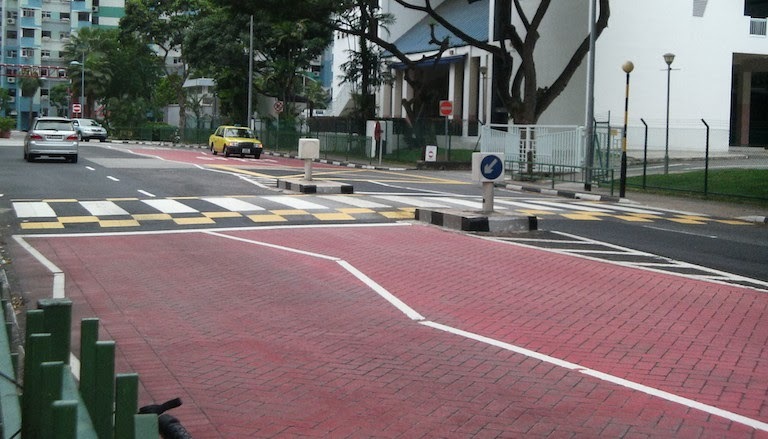 School Zones has been set up along schools in Singapore to ensure motorists will be driving in a more slower speed to ensure safety of young children crossing the roads in the school precincts. A Demerit Points for this offence will be increased with effect from 1st January 2014, motorist who are caught committing offence of careless driving, inconsiderate driving, beating red lights, or speeding within school zones will be given additional demerit points. This move is aimed at getting motorist to be more responsible and drive safely along vicinity of schools and motorists to think twice before committing an offence that can cost lives of vulnerable road users such as young children and students. It was also part of the initiatives developed under Safer Roads Singapore, trying to create a road culture where safe and courteous road use is habitual and instinct. *The maximum number of demerit points is capped at 24 points as the suspension of driving licences will take place after motorists have accumulated 24 or more demerit points within 24 months.